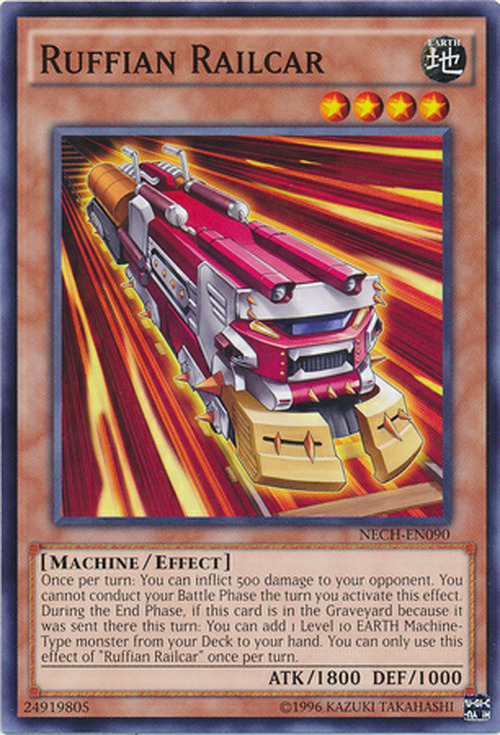 The last word in this card's Japanese name is a portmanteau of battle and train. During the End Phase of the turn this card was sent to the Graveyard, the "You can add 1 Level 10 EARTH Machine-Type monster from your Deck to your hand." effect starts a Chain Link. It does not start a Chain Link when this card is sent to the Graveyard. The "You can add 1 Level 10 EARTH Machine-Type monster from your Deck to your hand." effect can be activated even if this card is sent to the Graveyard from the hand or Deck. If a "Ruffian Railcar" that was sent to the Graveyard is no longer in the Graveyard during the End Phase because it was Special Summoned or banished, its effect cannot be activated. 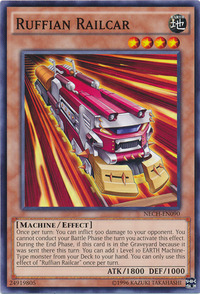 Also, if a "Ruffian Railcar" activates its effect during the End Phase and the effect of "D.D. Crow" is chained, even if "Ruffian Railcar" is no longer in the Graveyard, the effect resolves normally. : If a "Ruffian Railcar" that was sent to the Graveyard is no longer in the Graveyard during the End Phase, how does the effect resolve?